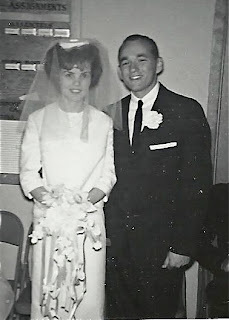 This week, my grandparents celebrate their 50th wedding anniversary! In 1963 Werner and Patricia said their vows in a small Texas church and headed to a nearby restaurant with a few close friends for a fried chicken dinner. They spent the night at a Ramada Inn in town, which my grandmother described in her wedding book as being very nice. Twenty-three years later my parents had an evening wedding that included a ceremony and small reception. Paul and Traci had a wedding cake table decorated with satin flowers that my mother had made. 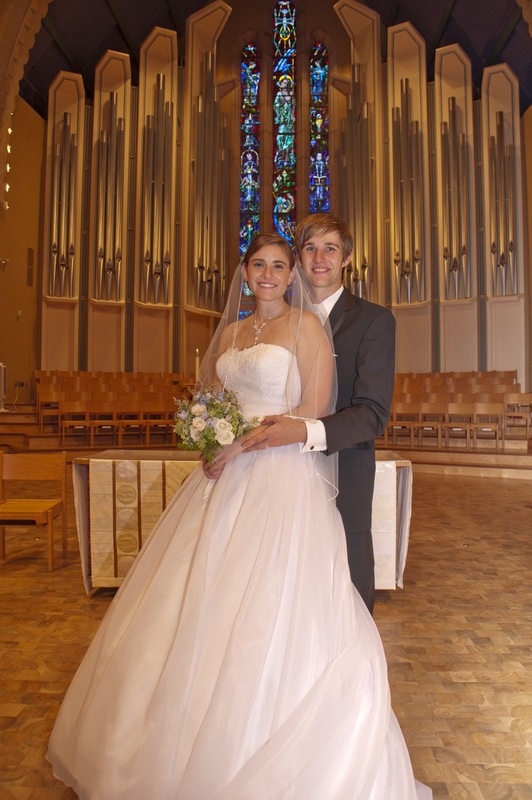 Owen and I were married in the St. Olaf College chapel in Minnesota. We held our reception ten minutes away in a tent with a formal dinner with thirty or so bottles of wine, several beautiful cakes, and a dance floor with a six-hour long playlist and a few wedding games. Our wedding day was so stressful that I ended up crying for at least a half hour upon arriving to the reception site. We escaped to Napa Valley for our honeymoon, which was largely spent recovering from the stress of the wedding. What has happened in wedding culture that makes us feel like we need to make our wedding days into such a show? Fifty years ago Werner and Patricia had a wedding without a photographer, reception dinner, dance floor, or long honeymoon, but the smiles in their one and only picture are so beautiful. In many ways their marriage continues to display the simple happiness of their wedding. For their anniversary this year they decided to take a trip to their favorite vacation spot in Estes Park, Colorado where they rent a cabin and don't leave it the whole week. When I called them to wish them a happy anniversary they were looking out the windows enjoying the view and watching for wildlife. My grandmother told me, as she often does, their story. Because they were always seated alphabetically in school, Werner sat in front of Patricia every year starting in the seventh grade. They didn't talk to one another until the eleventh grade when they were roped into a double date. As the story goes, Werner had a car and his friend had a date with a girl who was friends with Patricia. His friend needed Werner to drive, and Patricia was brought as Werner's date. Though the friends didn't really hit it off, my grandparents quickly fell in love and were married a few years later. As I was Growing up my grandparents emphasized getting away from televisions, computers, and phones. They taught me how to find happiness in many simple pleasures that I now share with Owen including card games, puzzles, quilting, and hiking. 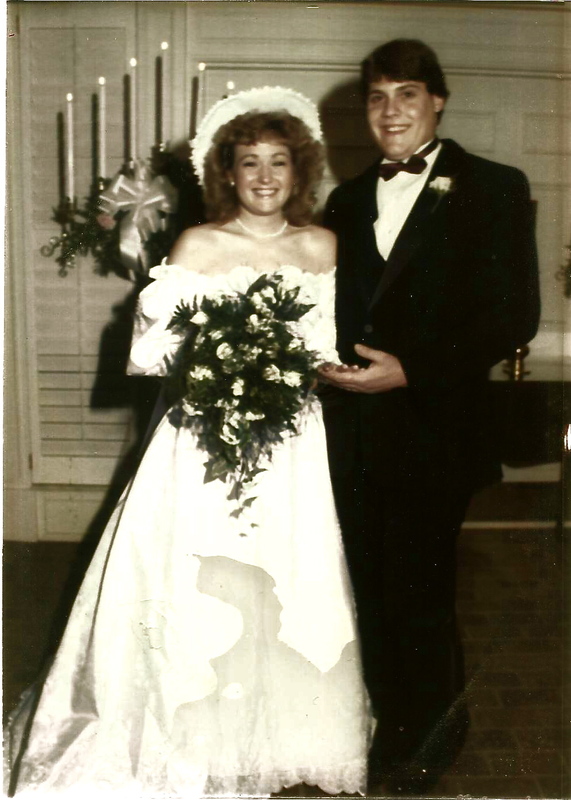 Happy Anniversary Werner and Patricia! As I posted just last month, I love Lent, but since the Easter Bunny stopped leaving me treats I haven't cared as much for Easter. 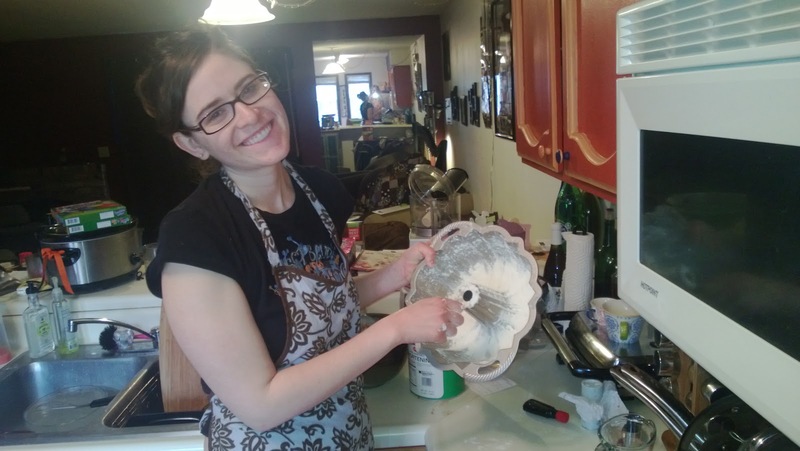 Supposedly, Lent is the time of sorrow and Easter the time of joy, but something about the running all over town visiting all of the relatives we can pack into one day and overeating feels more stressful than joyful. This year, Owen and I decided to make the trek to Minnesota for Grandma Inga's 80th birthday this coming weekend rather than visiting for Easter last weekend. So we celebrated on our own for the first time! I baked my mom's Apple Spice Cake, which turned out about 85% as delicious as when she makes it (still rather tasty). 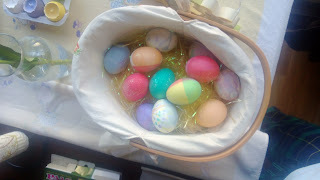 And of course we dyed Easter eggs. Our Easter celebration was simple this year, and we had time to reflect. Our time in Iowa has been marked by feelings of inadequacy. I have questioned my self-worth for choosing Owen over graduate school and for working with people with disabilities rather than pursuing more glamorous career opportunities. This has caused Owen stress and sadness as he has felt responsible for my unhappiness. His sadness with my path led me to worry that he too found my achievements inadequate. Along with my personal battle, we dealt with Owen's questions of self-worth as his counseling PhD proved more challenging than expected, and he experienced significant failure for the first time. Added to the academic stress, we faced the ill social judgements that often follow struggle. As he with me, seeing Owen face so much adversity is difficult for me. In the midst of so much unhappiness, we forgot what it is like to feel good on a regular basis. Lent provided us the cleansing we needed. We gave up over fifty unnecessary items that had filled our junk room, worry surrounding future career goals, and self-debasing thoughts stemming from the social and academic rejection we've experienced in Iowa. In many ways we stopped trying to control the uncontrollable, and we came to a greater acceptance of who we are. We are married. We are Lutheran (or as Owen puts it, Christian). We are not athletic. We don't always put our best feet forward. We support gay rights and don't judge people who don't. We are pro-life and don't judge people who aren't. We want to be green, but often fail. We never know what's trending on Youtube. We are imperfect, and we can't justify everything we say, do, feel, or believe. When Easter came we were ready for rebirth. As we sat in the balcony pews of the much-more-crowded-than-usual chapel, we connected to the whole. Owen reports feeling a greater sense of independence and a greater alignment with our life in Iowa. As for me, I sensed for the first time that my purpose and my desires have aligned in the very deep down truth that I want to love God, other people, and the earth more than I want to achieve societal acceptance. With that I have come to the understanding that what I do for a living will matter far less than what I live for.